It was a lousy evening on a Sunday. Swetha had cold and mild fever, though she was still ready to play with her friends. As it was drizzling outside, her mother didn't let her play outdoor as usual. "Why don't you play some indoor games today?" asked her mother. "Last Sunday the weather was so bright and my Dad took us to a zoo. We saw many animals and birds there. Among them, my favorite was Peacock," said Sujith. "Tell us more about peacock. I'd like to learn more about them. My mom has told me that they are the most beautiful birds all over the world," said Reema. "No problem. I'll tell you whatever I know about this beautiful bird. We can ask uncle to tell us whatever I don't know. ", said Sujith looking at the direction of Swetha's father, who was sitting with a newspaper on the reclining chair. "Sure children. You can ask me, and I'll tell you whatever I know," said Jayan, Swetha's father. "Peacock is the national bird of India," began Sujith to share his knowledge with his friends. "It is the most beautiful bird found all over the world. The male is called a peacock, and the female a peahen. A baby peafowl is called a peachick. " "They belong to pheasant family and there are three species of peafowl," added Jayan. "The most popular of the species is the Indian peafowl and it is the version that is found in most zoos around the world due to it's exquisite beauty. They are protected throughout the country, especially under Indian wildlife protection Act 1972." "What do they eat?" Swetha wanted to know. "Peafowls are omnivorous and feed on the ground. (eating both animal and plant foods.) They eat seeds, grains, insects, berries, plants, fruits, reptiles, arthropods and amphibians. They mostly search for food in early morning hours or before the sunset. Indian Peafowl do most of their food hunting in the early morning and shortly before sunset." "Uncle, do you know their zoological name?" Sujith wanted to note it down in a small paper, which he would like to rewrite to his note book at home, marked "Knowledge Book." Jayan liked the enthusiasm expressed by Sujith. "Yes, their zoological name is Pavo cristatus." "Interesting! What is their life span, uncle? How many years do they live?" that was the question from Reema. Jayan appreciated Reema's interest in peacock, too. "The average lifespan of the Indian Peafowl is about 20 years of age." That made Reema ask more questions. "Uncle, how do we know whether it is a female or male bird?" "As Sujith mentioned earlier, a male is called peacock. It has a length of 2.12 m (7,3 ft)and weighs about 5 kg (11 lbs). 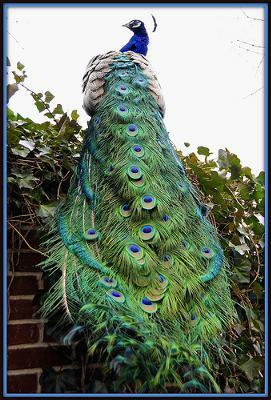 The most attracting part of the peacock is the fan or train of feathers that grow from its shimmering blue back. Each feather has an eye at the end of it. The train (1.4-1.6 meters in length) accounts for more than 60% of their total body length. The train makes the peacock one of the largest flying birds that exists today. The peacock’s head is shining, bright blue color and has a white patch under the eye. A female (peahen) is only has a length of about 86 cm (34 in) and weighs about 3.4 kg (7.4 lbs). Their color is also slightly different - is a mixture of dull green, grey and iridescent blue, with the greenish-grey color outweighing. Indian Peafowl is one of the most colorful bird. They have royal blue neck and breast. Both have fan shaped crest on their head, like a crown. Three toes face forward and one backward." "How do their eggs look, Daddy?" asked Swetha. Jayan was wondering why Swetha was not asking more questions like her friends. "The eggs are ivory colored and triple the size of a regular chicken egg. It takes about 28 days for the eggs to hatch. This time is called incubation period. During the incubation period, the mother will only leave the nest once per day to find food and water and when she returns she will make lots of noise to distract possible predators." After a minute, he continued. "When the eggs are hatched, and the peachicks come out. The mother will show them how to look for food by pointing at tiny morsels and making clacking sounds." "Where are they seen usually?" Sujith had another question. "They are mostly found in the dry semi-desert grasslands, scrub and deciduous forests. They are primarily seen south to east of the Indus River including Kashmir, Jammu east Assam, south Mizoram, and the entire India. Do you know that they are found in almost every village of Haryana?" "Oh, how nice!" said Swetha. "Do you know they are considered sacred birds in India?" Swetha's mother joined their conversation. "A peacock is considered sacred in India because its train features eyespots that are interpreted as “eyes of the gods”. 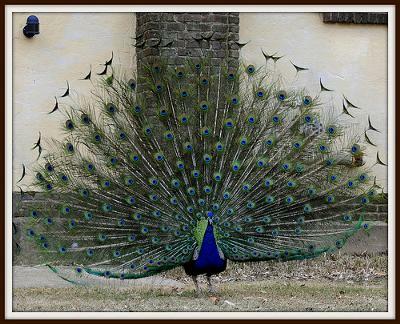 The peacock also exhibits qualities of splendor, pride, charm and holiness. In Hinduism it is seen as a symbol of the god of war, rains and thunder." "If you ever get a chance to see the elaborate courtship dance of a peacock, fanning out its tail and grooming its feathers, it will be most delightful sight to watch. Now watch this video to know how the peacock dances." She concluded. A lot of information for children! The video was very enjoyable. Thank you Vimala for reading this article and for your valuable comments. Children would be happy to see the pictures and the videos in an article, and hence I made it interesting for them. An excellent, very informative article,Lakshmi, Enjoyed reading it.You have taken so much pain to add the still picture and the video too.